Foreign currency is simply money valued against one currency or another,in most cases the U.S. dollar. Simply put, a forex trader is simultaneously buying one currency and selling off another. Money, after all, is what makes the world go ’round. There will always be demand and activity in this product. How to successfully trade this market or any market requires proper education of the vehicle in which you are trading and knowledge of the basic fundamentals and technical analysis tools. One also has to be fairly savvy in technology, as forex trading is virtually all done online through the Internet. Conquering the forex market and mastering success in trading absolutely requires identifying and learning how to avoid a multitude of pitfalls more than it does identifying trading opportunities. 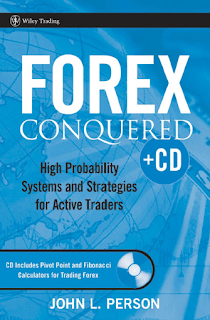 Forex Conquered gives traders easy-to-learn strategies to make the best trades. In this new book, John Person fully explains successful trading rules and trade management. He offers readers specific information on when to increase lot size, how to manage risk, when to move stops, and how to use automated trading programs. Furthermore, he explains how an individual retail forex trader can build a “black box” forex system.